Video Graphics Array (VGA) refers specifically to the display hardware first introduced with the IBM PS/2 line of computers in 1987, but through its widespread adoption has also come to mean either an analog computer display standard, the 15-pin D-subminiature VGA connector or the 640×480 resolution itself. While this resolution was superseded in the personal computer market in the 1990s, it is becoming a popular resolution on mobile devices. VGA was the last graphical standard introduced by IBM that the majority of PC clone manufacturers conformed to, making it today (as of 2010) the lowest common denominator that all PC graphics hardware can be expected to implement without device-specific driver software. For example, the Microsoft Windows splash screen appears while the machine is still operating in VGA mode, which is the reason that this screen always appears in reduced resolution and color depth. VGA was officially followed by IBM's Extended Graphics Array (XGA) standard, but it was effectively superseded by numerous slightly different extensions to VGA made by clone manufacturers that came to be known collectively as Super VGA. 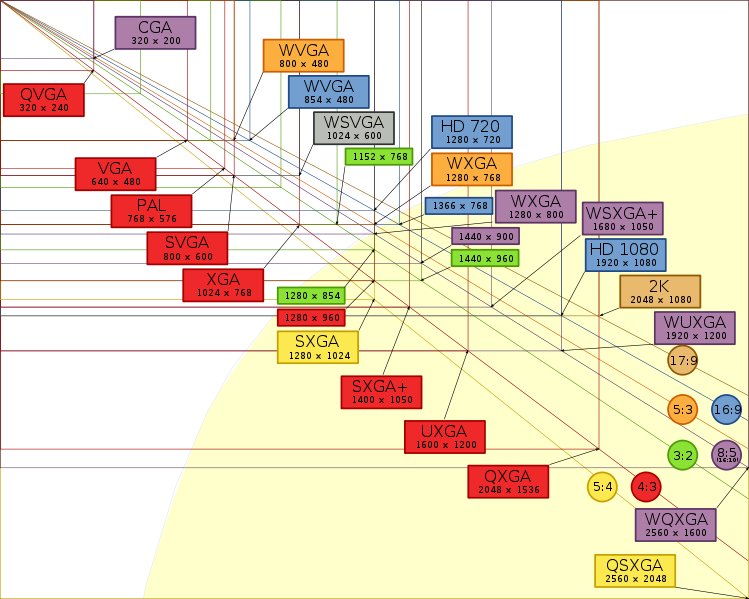 VGA compared to other standard resolutions. As well as the standard modes, VGA can be configured to emulate many of the modes of its predecessors (EGA, CGA, and MDA). Compatibility is almost full at BIOS level, but even at register level, a very high value of compatibility is reached. VGA is not compatible with the special IBM PCjr or HGC video modes. 640 × 400 @ 70 Hz is video mode used for booting most x86 personal computers. 640 × 480 @ 60 Hz is the default MS-Windows graphics mode with 16 colors. The actual timings vary slightly. For example, for 640×480 @ 60 FPS, a 25.17 µs active video time with a pixel frequency of 25.174 MHz gives 633 pixels rather than the expected 640. Like EGA, VGA supports 512 simultaneous characters on screen by disabling one color bit. The glyphs on 80×25 mode are normally made of 9×16 pixels. Users may define their own character set by loading a custom font onto the card. As character data is eight bits wide, some characters are normally made nine bits wide by repeating the last vertical line, especially those defining horizontal IBM box drawing characters. Examples of VGA images in 640×480×16 (top) and 320×200×256 modes (bottom). Dithering is used to mask color limitations. In addition to the extended palette, each of the 256 entries could be assigned an arbitrary color value through the VGA DAC. The EGA BIOS only allowed two bits per channel to represent each entry, while VGA allowed six bits to represent the intensity of each of the three primaries (red, blue and green). This provided a total of 64 different intensity levels for red, green and blue, resulting in 262,144 possible colors, any 256 of which could be assigned to the palette (and in turn out of those 256, any 16 of them could be displayed in CGA video modes). 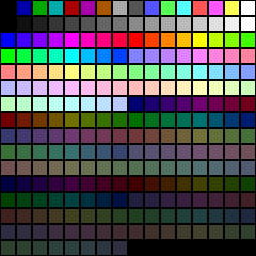 While CGA and EGA-compatible modes only allowed 16 colors to be displayed at any one time, other VGA modes, such as the widely used mode 13h, allowed all 256 palette entries to be displayed on the screen at the same time, and so in these modes any 256 colors could be shown out of the 262,144 colors available. Several higher-resolution display modes were possible: at 16 colors, 704×528, 736×552, 768×576, and even 800×600. Software such as Xlib (a VGA graphics library for C in the early 1990s) and ColoRIX (a 256-color graphics program), also supported tweaked 256-color modes using many combinations of widths of 256, 320, and 360 pixels, and heights of 200, 240, 256, 400, and 480 lines (the upper limit being 640×400 which used 250 KB of VGA's 256 KB video ram). However, 320×240 was the best known and most-frequently used since it was a typical 4:3 aspect ratio resolution with square pixels. The use of multiple video pages in hardware allowed the programmer to perform double buffering, triple buffering or split screens, which, while available in VGA's 320×200 16-color mode, was not possible using stock Mode 13h. Sometimes the monitor refresh rate had to be reduced to accommodate these modes, increasing eye strain. They were also incompatible with some older monitors, producing display problems such as picture detail disappearing into overscan, flickering, vertical roll, and lack of horizontal sync depending on the mode being attempted. Because of this, most VGA tweaks used in commercial products were limited to "monitor-safe" combinations, such as 320×240 (square pixels, three video pages), 320×400 (double resolution, two video pages), and 360×480 (highest resolution compatible with standard VGA monitors, one video page). Currently, the highest known tweaked VGA resolution is 400×600×256 (400×600 pixel × 256 colors). It is used in Fractint, a popular fractal generator.